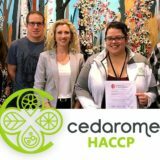 Candiac, September 7th 2018Cedarome Canada Inc. is proud to present its new image, which was inspired by Anne-Marie Crepin, Director of Marketing and Business Development at Cedarome. With our move into a new facility in 2015, a major reimagining of our identity was initiated. 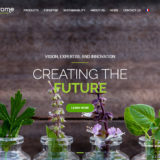 This project was recently completed by Nadine Demeule, Cedarome’s Communication-Marketing Officer, who joined the company in May 2018. COLOUR: Lime green is an amalgamation of green representing Nature, and the “nature business” we are in and yellow for citrus, one of our main product lines. The logo is always presented on white to reinforce the importance of purity. FORM: An outer C for Cedarome, containing 4 drops inscribed in a clover, symbol of luck. The number of drops contained within the clover representing the number of product lines we have. ICONOGRAPHY: An icon for each product line: A Flower for Essential Oils, A Lemon for Citrus; A Leaf for Canadian Naturals, and a round-bottom Flask for Natural Isolates. TYPOGRAPHY: Contemporary elegance is represented with fine-lined, lower-case letters, of which the rounded shapes are reminiscent of molecules. The m in Cedarome is lengthened to evoke the appreciation of aroma as in ‘’mmm’’. To conclude the identity revamp, the slogan was revisited to better express our essence: ‘’Nature Serving the Senses’’. Now that the new identity is born, you will see it on our new website, documentation, signage and social media!